In October Peter went public with his announcement that he will dissolve the current line-up of Arcana. This has been on his mind for a long time, and something all members of Arcana new. 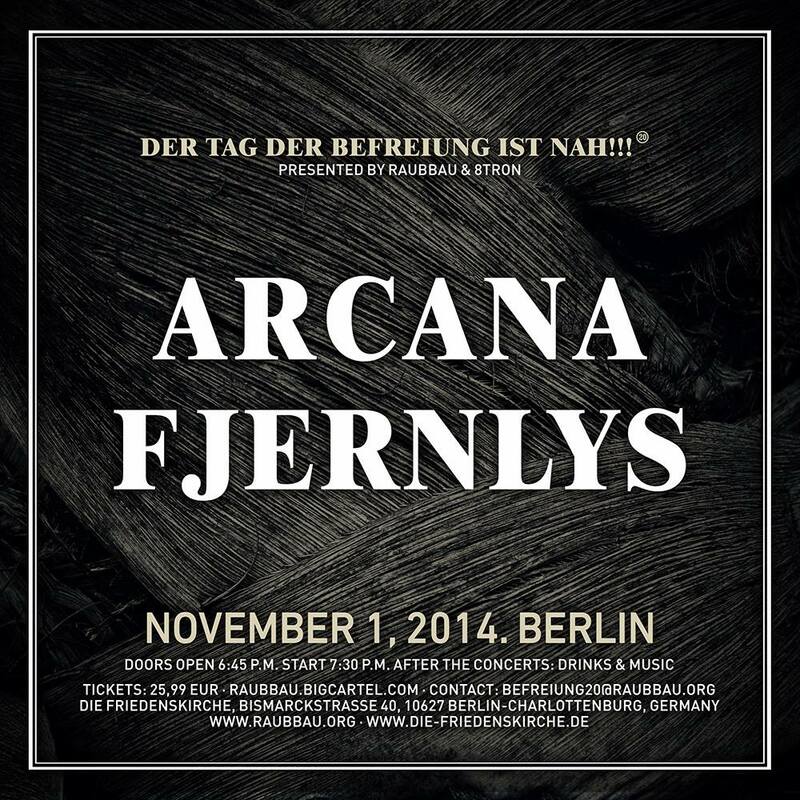 concert we make in Berlin November 1st, 2014. It is really sad when you notice that we haven't updated our own website in almost a year. Last year was turbulent, and not much was done musically. Peter have been focusing on his next solo album, but also started to work with the next Sophia. 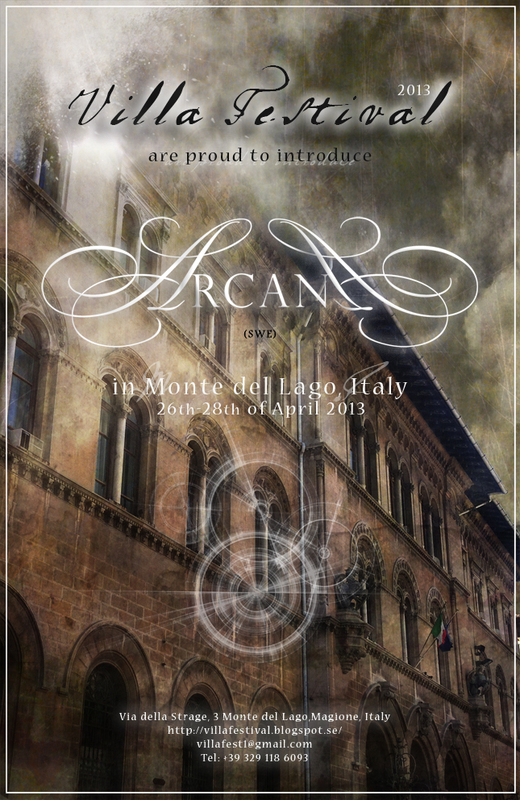 Arcana will also get space this year, 2014, a year when Arcana has its 20th birthday. that we just uploaded on Bandcamp. Right now, Peter Bjärgö is on a small mini tour together with Desiderii Marginis and Empusae. Once back home again, it will only be two weeks and then we are coming to Italy and two weks after that we are coming to Paris. We can't wait to be back on stage again and to see all you lovely people! 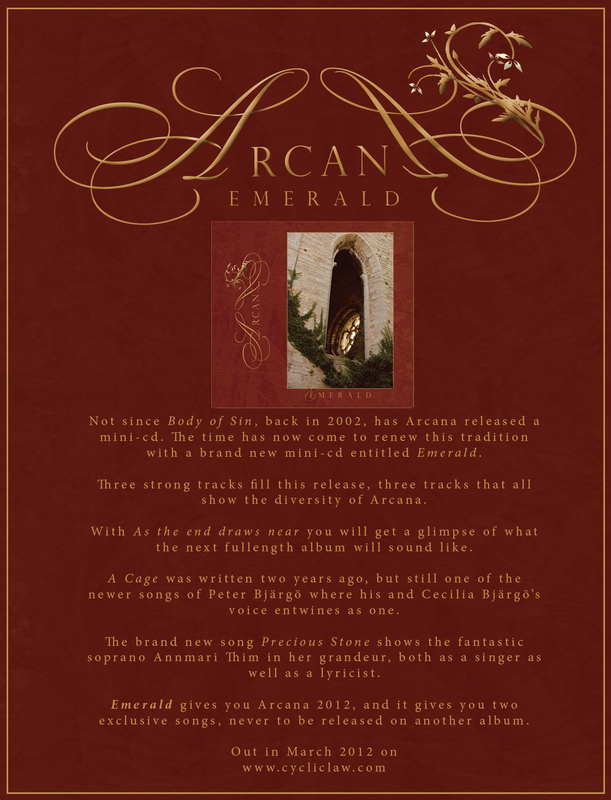 Arcana is part of the Cyclic Law's 10th Anniversary Label Sampler. 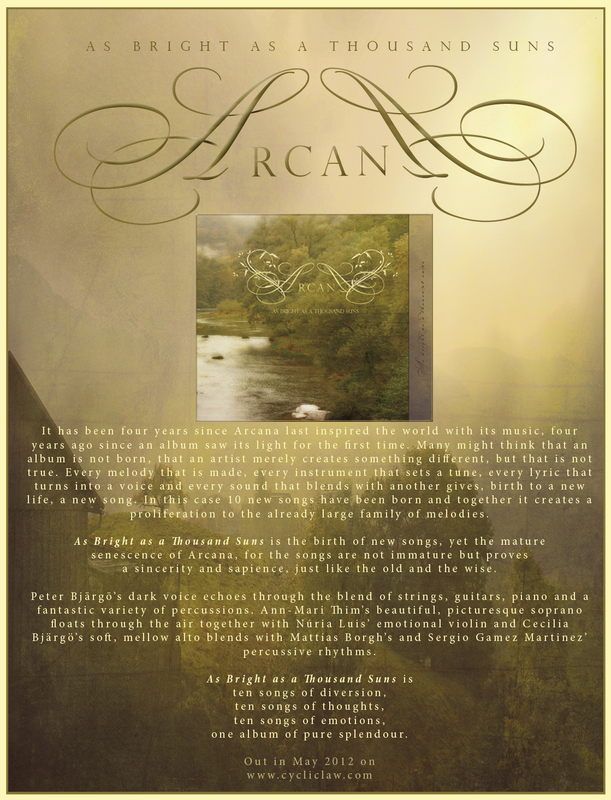 With the song For our Continuity, Arcana moves back to earlier sounds and territories. We want to wish you all a Happy New Year. We begin with thanking all of you who supported us during our gigs in Stockholm and Turku. We had an amazing time and we loved every minute of it. Then some bad news. Due to the financial crisis in Greece, our concert in Athens has to be postponed until this autumn. Hopefully we soon have better news for you. 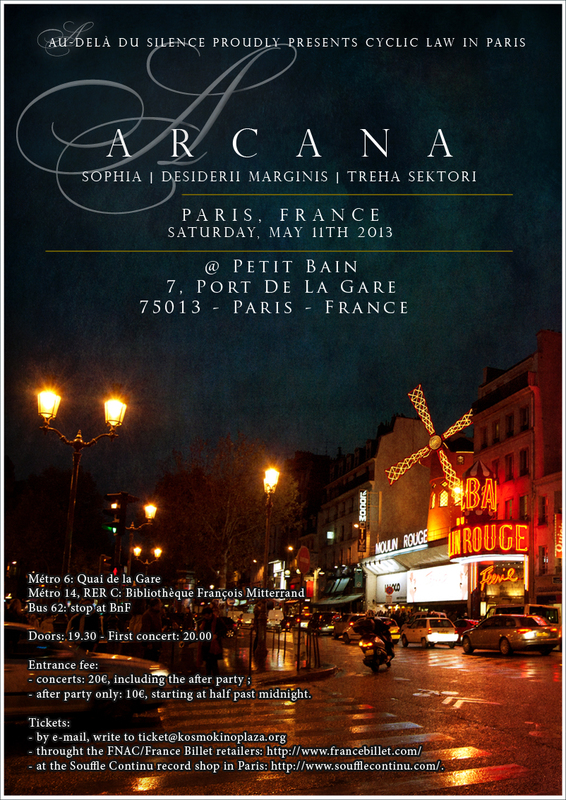 But we are happy to announce our return to Paris, France. On May 11th, we will perform ono the 10th anniversary of Cyclic Law. 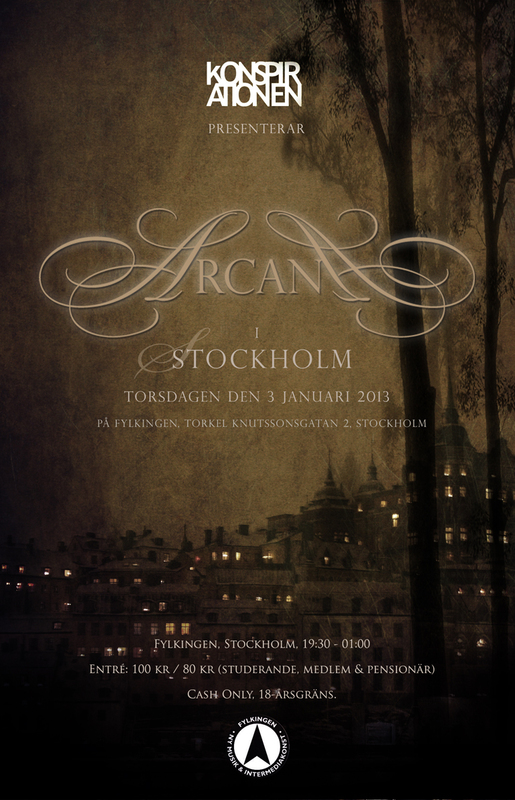 Dont forget our concert in Stockholm and Turku this following week. 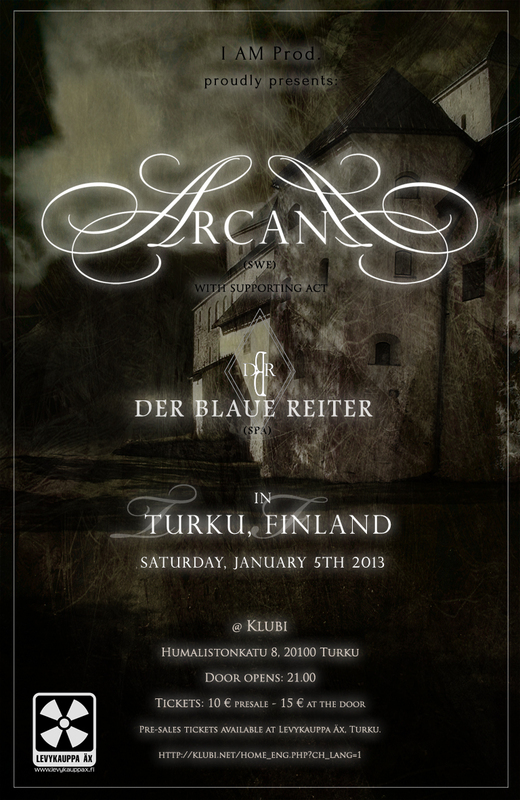 Stockholm on the 3rd of January and Turku on the 5th of January 2013. The new album As Bright as a Thousand Suns is now released since 4 days. You can find it at www.cycliclaw.com. Join us at Facebook for the latest news and updates. 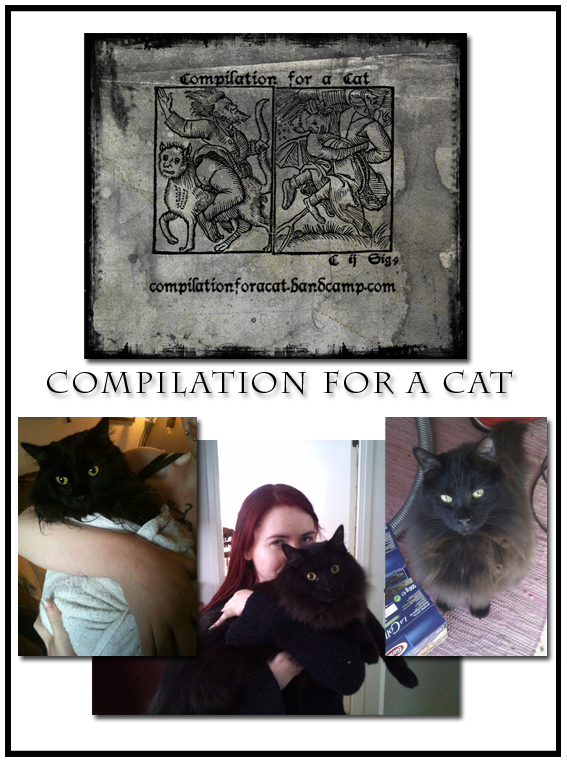 This compilation has been put together by myself: Amanda Votta, with the assistance of Peter Bjärgö, Neddal Ayad and Michael Tanner, to help raise funds for my cat Bran's medical expenses. At the beginning of December Bran badly injured his right hind leg. At first, the veterinarians thought he had a small fissure in his tibia, but after two weeks and new x-rays, it became apparent that the real problem was a broken thigh and hip. A piece of the bone has actually broken off and needs to be removed. The surgery will cost 15,000SEK—approximately $2,187 US—which is more than I can afford after all the previous visits and x-rays. He also needs rehabilitation after the surgery since the muscle in his leg has deteriorated and become stiff from lack of use. Bran, the cat in need, will be two years old on the 18th of March—young enough that they anticipate a full recovery if he gets the necessary surgery as soon as possible. 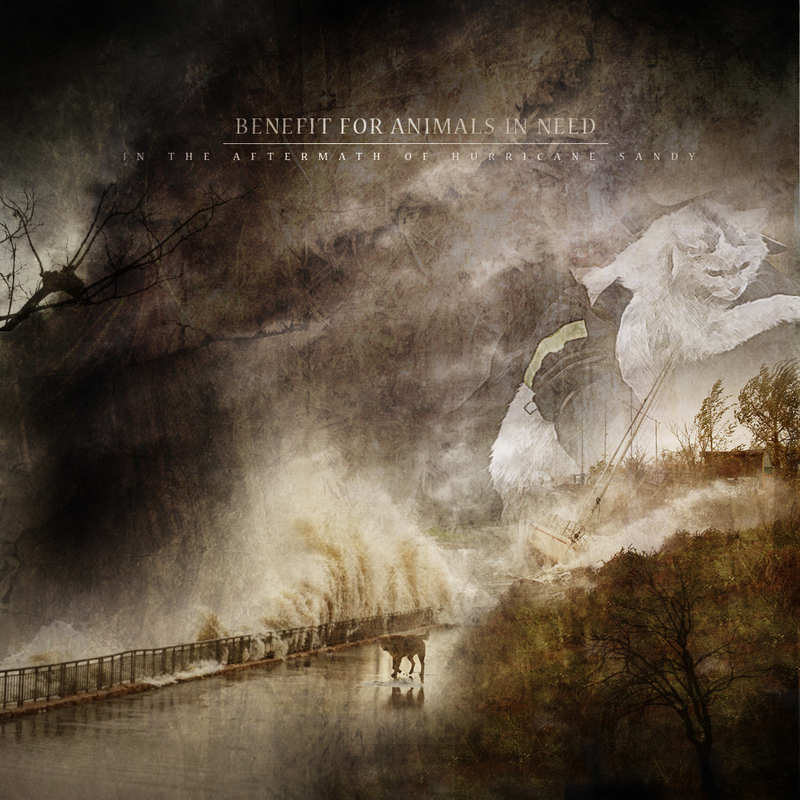 All of the proceeds from this compilation will go directly to Bran's expenses. I'm not profiting by it and the artists involved have kindly donated these songs so that Bran can get the help he needs. The compilation will be a digital download available on bandcamp the 10th of January as a donate/pay what you will release. Many of the songs are unique to this compilation and others have been previously released and are no longer available, some wil l be on future releases. This compilation will only be available for a limited time, after which it may be quite a while before some of these tracks are heard again, if at all. We are so happy that so many artists have agreed to participate. We are talking about a large part of the industrial scenes artists who are all big cat enthusiasts. Peter Bjärgö, the man behind the now legendary groups ARCANA and SOPHIA is back with his second solo album. we are now facing this illness again around the world and this album is a real journey with the melancholic mind. engulfing dark ambient and the sheer power of Peter's voice make this album a shining diamond among stones. from the European Gothic/Dark scene. Supporting them will be an exciting new project from two established UK musicians. 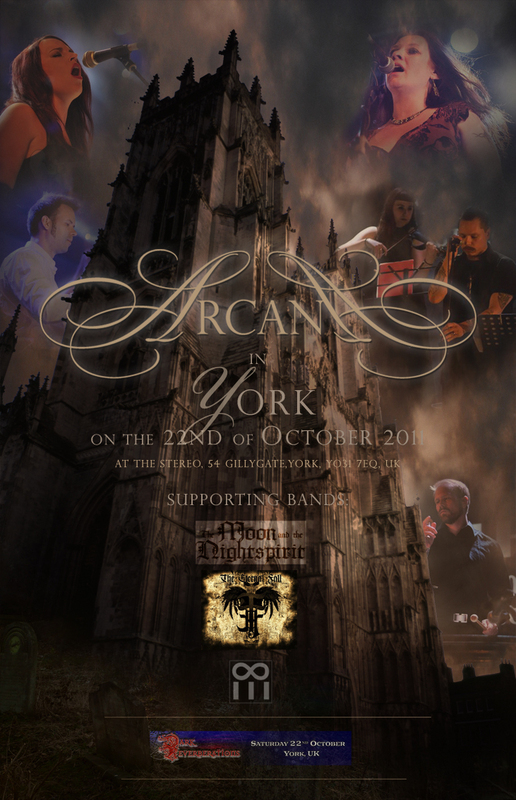 and Andy C (Continuum, Black Veil) playing the best Dark and Gothic music from around Europe. We are proud to announce our first concert in Portugal on July 31st 2011. It wil be at the Entremuralhas Festival, organised by Fade In. Other bands who will play are Sol Invictus, Narsilion, Rosa Crvx, Nitzer Ebb, Suicide Commando and Irfan. The tickets are 25€ for a one day ticket and 60€ for a three day ticket. Arcana has been recording violin and percussion with Núria Luis and Sergio Gamez Martinez during their visit in Eskilstuna. The new album (fullength) is slowly progressing. Before that one it done, Ia Bjärgö will perform with Ms Luis and Mr Martinez and their band Narsilion at Wave Gothik Treffen in Lepzig at 13.00 on the 12th of June at the Pagan Village. 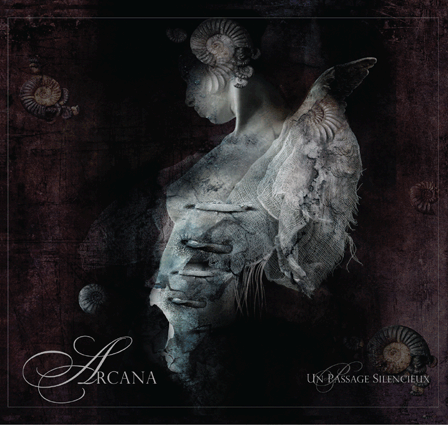 Arcana will participate in "Dark artists for Japan earthquake resque" with an unreleased song entitled "The Irreversible Truth". Press the picture for a direct link to iTunes! 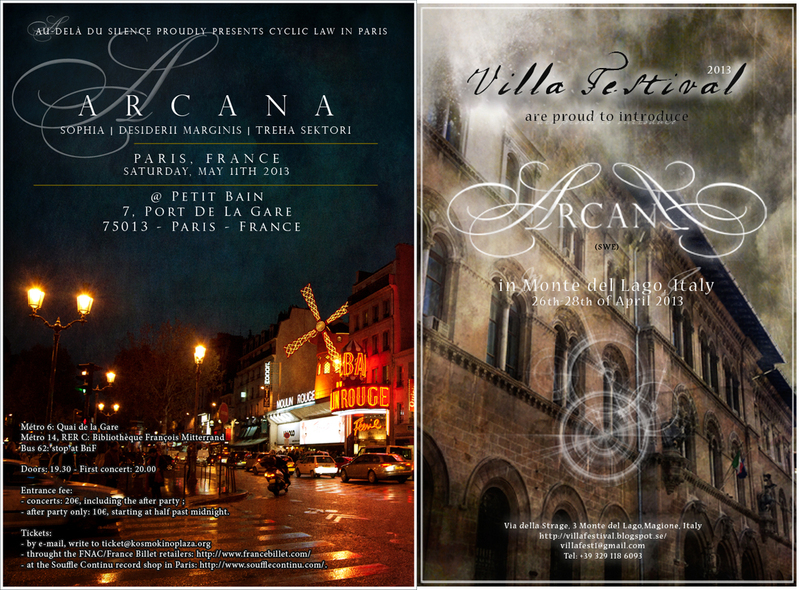 Contact us at arcana@erebusodora.net, if you have further questions.